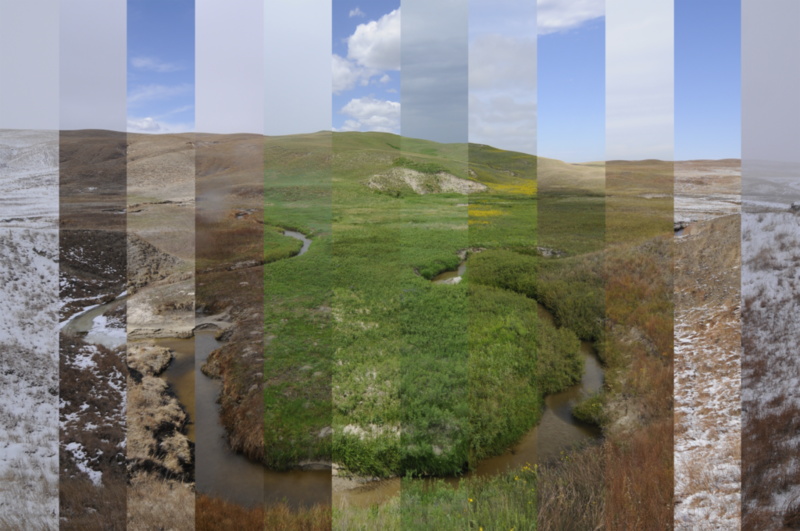 Time and the River is performance art of newly commissioned chamber music for nine instruments, inspired by and incorporating photos from the Platte Basin Timelapse photographic project, devised and begun in early 2011 by conservation photographer Michael Forsberg and photographer-film producer Michael Farrell, both of Lincoln. More than 60 time-lapse camera systems are in place throughout the 90,000 square-mile Platte River basin, from the river’s headwaters along the Continental Divide in the Colorado Rockies to its confluence with the Missouri River on Nebraska’s eastern border. Each camera tells one part of the story of the water’s roughly 900-mile journey through the heart of North America. The chamber music is composed by Kurt Knecht, organist, conductor and composer of Kansas City. He emphasizes that the piece is neither a score for a visual presentation nor, by design, a stand-alone composition. Rather, it is music integrated with the time-lapse photos as a single artwork to express the Platte River through performance. 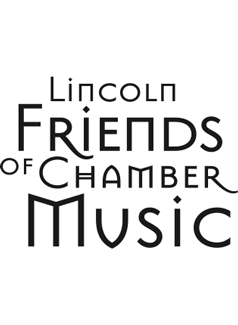 This concert will be the world première, performed by a nine-member faculty chamber ensemble of UNL’s Glenn Korff School of Music, consisting of John Bailey, flute; William McMullen, oboe; Diane Barger, clarinet; Jeffrey McCray, bassoon; Alan Mattingly, horn; David Neely, violin; Clark Potter, viola; Karen Becker, cello; Hans Sturm, bass. Single concert ticket prices: $15 adults; $5 students. 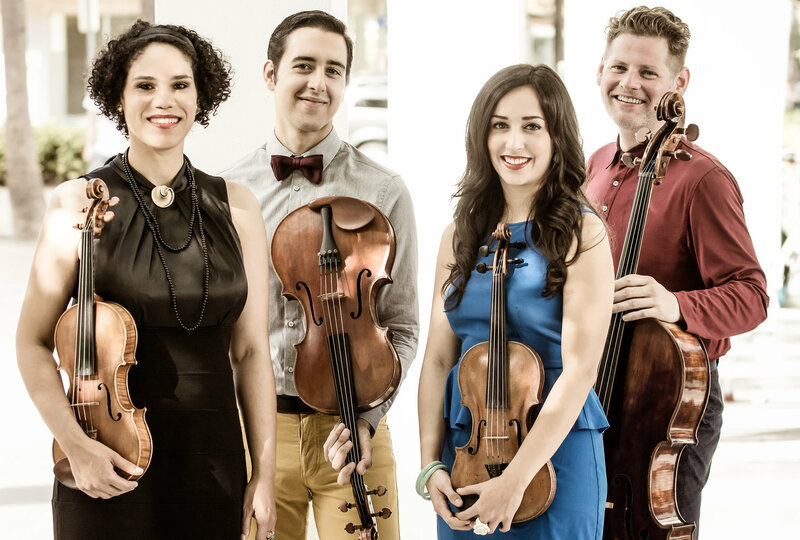 Hailed by the New York Times at their Carnegie Hall debut as “invariably energetic and finely burnished… playing with earthy vigor,” Catalyst Quartet is comprised of top Laureates and alumni of the internationally acclaimed Sphinx Competition. Known for “rhythmic energy, polyphonic clarity and tight ensemble-playing,” the ensemble has toured throughout the United States and abroad, including sold-out performances at the Kennedy Center in Washington DC, at Chicago’s Harris Theater, Miami’s New World Center and Stern Auditorium at Carnegie Hall. The quartet has also appeared as concerto soloists with the Bogotá Filharmónica, the Sphinx Virtuosi, and the St. Paul Chamber Orchestra. Founded by the Sphinx Organization, the Catalyst Quartet combines a serious commitment to diversity and education with a passion for contemporary works. In October 2016, the Quartet completed their sixth national tour as principal players and featured ensemble with the Sphinx Virtuosi. Catalyst Quartet members serve as principal faculty at the Sphinx Performance Academy at The Cleveland Institute of Music and Roosevelt University. We welcome them back to Lincoln. Amara (from Latin): immortality, mythic paradise, the eternal, that which is beloved. Single concert ticket prices: $25 adults; $5 students. Three renowned visionary artists of the next generation combine talents in this eclectic new piano trio, JCT (pronounced ‘junction’). 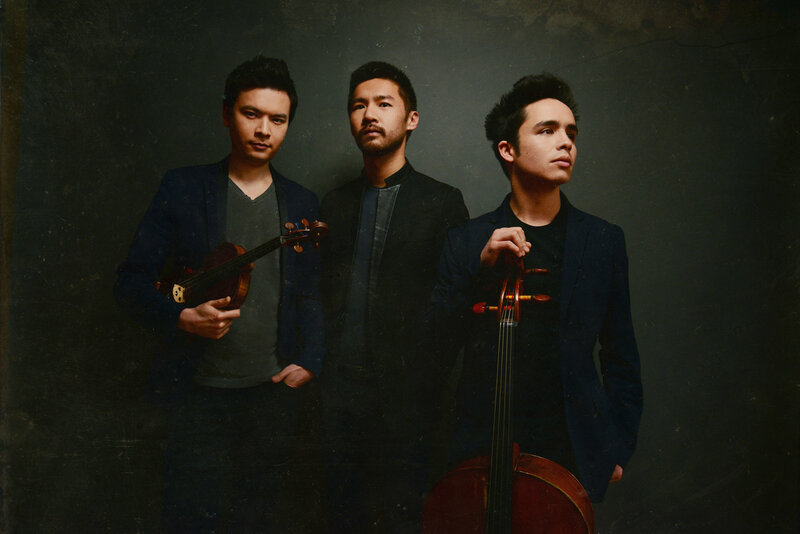 Violinist Stefan Jackiw, recognized for musicianship that combines poetry and purity with an impeccable technique, joins pianist Conrad Tao and cellist Jay Campbell. Tao, who appears worldwide as a pianist and composer, has been dubbed a musician of “probing intellect and open-hearted vision” by the New York Times. Approaching both old and new works with the same curiosity and emotional commitment, Campbell has been called “electrifying” by the New York Times. Recent concerts of the trio have included performances at Washington Performing Arts, Portland Ovations and The Royal Conservatory in Toronto. 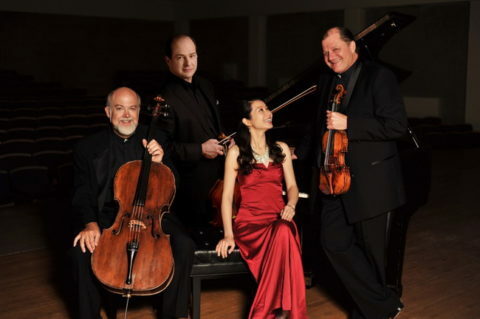 Diderot String Quartet—named after the prominent eighteenth-century French philosopher and Boccherini enthusiast Denis Diderot—came together in 2012 after having met at Oberlin Conservatory and The Julliard School. The four musicians share a background in historical performance and a passion for the string quartet genre; they quickly found the thrill of exploring the latter repertoire on period instruments to be irresistible. Diderot String Quartet brings a fresh approach to both familiar and lesser-known works of the eighteenth and nineteenth centuries.